Mini Grapefruit & Vanilla Bean Bundts — potato chips are not dinner. What I love in mini bundts are where cupcakes tend to fall short. I'm a frosting girl. I'm also a cake girl but I see cupcakes as mostly a vessel for the sweet stuff. In mini bundts, you get some in every bite AND it doesn't get all over your face. I love citrusy desserts, so I thought I'd try my hand at making something that incorporated the oft-overlooked and badmouthed grapefruit. The vanilla bean in the pound cake neutralized any bitterness, and the tangy sweet cream cheese frosting pairs perfectly with the tart grapefruit flavor. They were gone faster than I could glaze them. Preheat oven to 350°F . Grease and flour your pan generously to prevent your mini bundts from getting stuck. Juice grapefruits, and reserve juice for the glaze and the simple syrup and the peel for zesting. Mix together flour, baking powder, baking soda, and salt. In a separate bowl, beat butter and sugar until pale yellow in color and fluffy in texture , about 3-5 minutes.Add in vanilla bean paste and grapefruit zest. Add eggs 1 at a time, beating well after each addition, until well combined. Slowly add in flour mixture until just combined Spoon batter into pan, smoothing and spreading evenly. Bake for about 25-30 minutes, or until the edges of the bundts are golden brown, and a toothpick inserted comes out clean. Allow to cool before taking out of their molds, and drizzle with grapefruit simple syrup. In a large bowl, mix all of your cream cheese glaze ingredients on high until everything is smooth and velvety. If the mixture is too thick for pouring, add more milk and powdered sugar one tablespoon at a time. 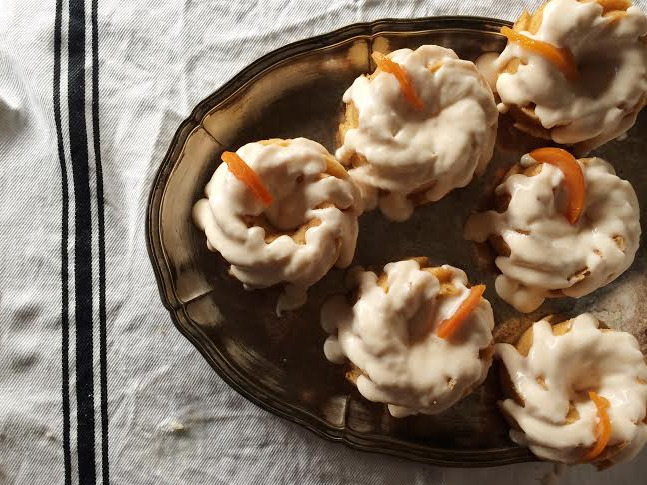 Drizzle glaze over bundts and garnish with candied grapefruit peel or zest, if desired. Juice all grapefruits, and reserve juice for the glaze and the simple syrup and the peel for zesting. Mix together flour, baking powder, baking soda, and salt. In a separate bowl, beat butter and sugar until pale yellow in color and fluffy in texture , about 3-5 minutes.Add in vanilla bean paste and grapefruit zest. Add eggs 1 at a time, beating well after each addition, then beat in lemon extract until well combined. Slowly add in flour mixture until just combined Spoon batter into pan, smoothing and spreading evenly. Bake for about 25-30 minutes, or until the edges of the bundts are golden brown, and a toothpick inserted comes out clean. Allow to cool before taking out of their molds, and drizzle with grapefruit simple syrup. In a large bowl, mix all of your cream cheese glaze ingredients on high until everything is smooth and velvety. If the mixture is too thick for pouring, add more milk and powdered sugar 1 tablespoon at a time.